The huge "astronomical" scales we have to deal with when we talk about space exploration make it extremely difficult to reach our own backyard planets. But now, a new projects shines a light at the possibility of reaching Alpha Centauri in just 20 years. If you keep an eye on space missions, you'll know it takes years for us to reach the farthest plantes of our own solar system. So, reaching the closest star to the Sun, Alpha Centauri, 4.4 light years away, would seem an impossible task - as it would take over 30 thousand years to get there, using our fastes spaceship. 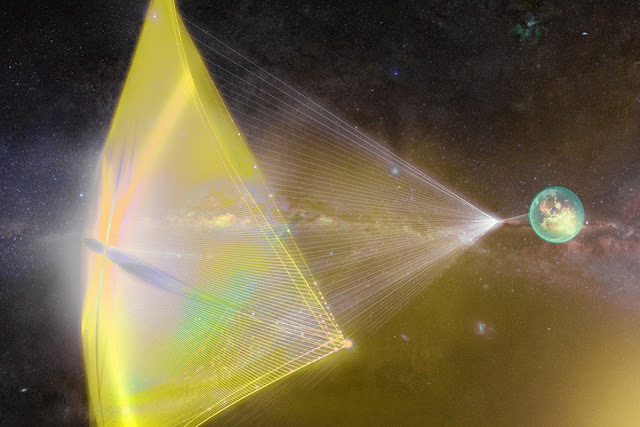 But Breakthrough Starshot wants to try a different approach, and create nano-sized spaceships, with all the electronics, cameras, sensors, communication, etc. in package weighing about 1 gram, and attach it to also a gram-scale light sail that could be propelled by lasers shot from the Earth. Theoretically, such nano-ships (and there would be thousands of them) could be accelerated up to about 20% the speed of light, which would put them in Alpha Centauri in just 20 years. They'd speed past it quickly, but they'd be able to send back some valuable close range info from it.